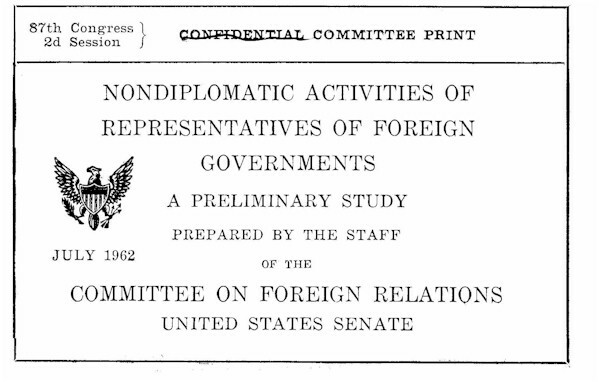 "In recent years there has been an increasing number of incidents involving attempts by foreign governments, or their agents, to influence the conduct of American foreign policy by techniques outside normal diplomatic channels…..there have been occasions when representatives of other governments have been privately accused of engaging in covert activities within the United States and elsewhere, for the purpose of influencing United States Policy (the Lavon Affair)." On October 21, 2010 the National Archives and Records Administration released Box #1 (of 67) from sealed US Senate records about the activities of non diplomatic representatives of foreign governments active in the United States. The formerly classified documents reveal the rationale for extensive investigations and Justice Department enforcement actions in 1962-1963. Top US lobbying firms, public relations consultants and foreign lobbying groups were ordered to submit records under threat of subpoena to Senate Foreign Relations Committee researchers. The "Lavon Affair" refers to a false flag Israeli terrorist bombing plot code named “Operation Susannah” against US and other targets in Egypt. It was designed to reverse US policy pressuring British withdrawals and reverting control of the Suez Canal to Egypt. Israeli agents infiltrating as Arabs were discovered, arrested and criminally prosecuted in Egypt when their explosives malfunctioned, leading to a crisis in the Israeli government and relations with the US. The Senate record of the May 23 and August 1, 1963 hearings on Israel lobbying outline covert activities, but many were heavily redacted at the insistence of the Jewish Agency and its allies in Congress. No testimony on the Lavon Affair or any other false flag attacks was ever given during the investigation. "Lenvin [Nathan Lenvin, head of the FARA Section at DOJ] told me that the Library [of Congress] had set aside a room to handle all the material that was flowing up there, but everything turned out to fit on just a few shelves. The man in the stacks who has jurisdiction over the material said I was the first person who had ever come to look at it." ..."U.S. v. Hector Garcia Soto On May 3, 1960, an indictment was returned in the Southern District of Florida against Hector Garcia Soto for a willful failure to register under the Foreign Agents Registration Act. The case went to trial and the defendant was acquitted by the jury...."
"When we get into the lobby hearings, JWF (J. William Fulbright) would like to obtain from the Zionist outfits a list of individuals who have spoken to them in the past, and how much they got paid?" "1. To what extent is United states foreign policy being influenced through nondiplomatic channels by foreign governments and other foreign groups? 2. To what extent are the following - and other - channels being used by foreign governments? 3.To what extent are the following - and other - practices employed by foreign governments? 4. Is the Foreign Agents Registration Act adequate to protect the American public against improper influences by foreign governments and parties? 5. Do traditional international concepts of t1improper interference in internal affairs" require review? At what point does the need of the U. S. Government to influence foreign governments and public opinion impose a limit on U. S. restraints on propaganda and public relations activities of foreign governments here? 6. To what extent are intelligence and internal security agencies of the U. S. Government cognizant of propaganda and public relations activities of foreign governments and parties? To what extent do such agencies facilitate or sponsor such activities?" 10/05/1961 Memorandum for the Record: "Timing of further staff investigation regarding non-diplomatic influences by foreign governments." "The chairman decided today that he liked the attached outline [9/29/1961] of a further staff investigation on this subject and the idea of hiring Walter Pincus to help John Newhouse, but he also decided that the start of such additional staff work should be delayed until 1, April of 1962." Archive Justice Department Orders the American Zionist Council to register as an Israeli Foreign Agent - partially based on Senate Foreign Relations Committee preliminary work. Redacted Senate report on Israel lobbying.